Exciting. I hear that word all the time especially in church. I wonder if we are addicted to it because of our entertainment culture. But, some stuff that really matters is mind-numbingly tedious. Person in church: What kind of mission work do you do? Person in church: Wow, how exciting! I could go into a lot of narcolepsy-inducing details about language survey. You might be interested in some facts about languages which are dying. But a discussion of a question like “What is a language?” might cause you to recommend me to your local sleep clinic – as a therapist! Early on, those doing language survey started publishing a book cataloging the languages of the world, the Ethnologue. For years, every new edition of the Ethnologue would have about 400 more languages than the earlier edition. While we were in Burkina Faso, some of my colleagues discovered two previously unknown languages. They appeared in the next edition of the Ethnologue. The number of languages in the Ethnologue stabilized in the mid 1990s at around 6,900, meaning that the list was finally very accurate. That is hardly exciting, but it is very significant. Most Bible translations in new languages published for the last 30 years were done because the languages were identified and cataloged in the Ethnologue. Otherwise, those languages might never have gotten a translation. In one man’s lifetime, we have gone from a wildly inaccurate estimate of 500 languages to a highly reliable catalog. In fact, the Ethnologue is so reliable that it has become an official standard of the International Standards Organization. 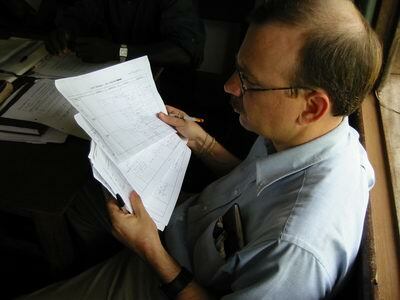 For the first time we know how many language still need a Bible translation and we can project how much time, money and energy that will take. 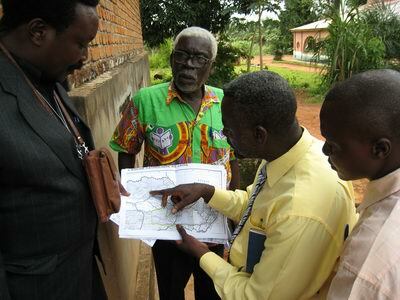 Church leaders, like the ones in the photo pouring over a language map from the Ethnologue, have information they need for their ministries. It might be a little exciting because it is a sign of the end times, if only a minor one. 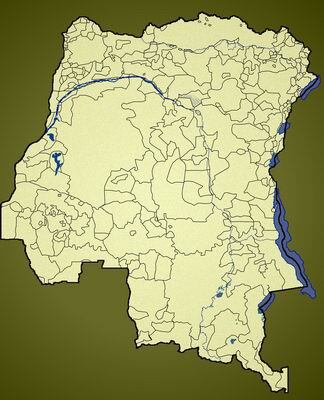 I don’t know what we would do in Congo if we did not have a language map like the one below to tell us where each of the 223 languages is located. Knowing where the languages are and how they are related also allows us to add some time and money-saving ways of working. My hat is off to all those who have cataloged languages, including the young woman I knew who died in an automobile accident in Africa while doing her “uninteresting” work. So, let me know what you think. Do you think that “exciting” has too much attraction for us? Might our fascination with the exciting sometimes keep us from the important? Would you pray for someone doing language survey, or give financial support? Update: Someone else wrote about boring stuff: We Need Boring Christians. Check it out. If you feel the way we do, or you want to know more, see our website, subscribe to this blog, talk with us on Facebook, or sign up to support us through prayer or financial support.